SWCRR Stop Work Order Imminent? "Over the next 10 years, we are going to see more changes in the way people use our transportation systems than we have in the last 50 years. Given the rapid changes we expect to see, it is important that we rethink how we plan our network. As demographics and technology change and evolve, we need to ensure we are not planning to encourage urban sprawl. Outer ring roads do not align with that vision and I would like to confirm future network planning will not include outer ring roads." Given this much-appreciated strategic decision, YYC Cares calls on Minister Mason to issue an immediate "stop work order" to KGL Constructors regarding the Southwest Calgary Ring Road (SWCRR) so that design changes can be made. 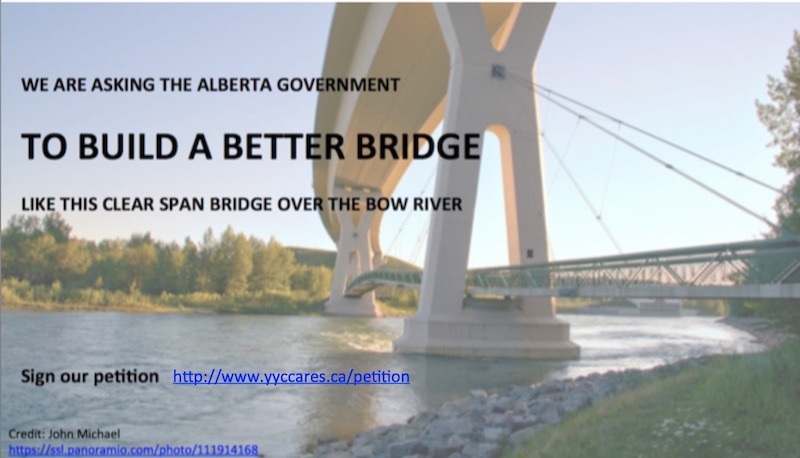 For example, the highly contested earthen berm bridge crossing across the Elbow River valley, Calgary's most biodiverse river valley, no longer requires the "ultimate design" of 16-lanes and 5 bridges. This means that the amount of work can be scaled back, which in turn minimizes the harm to the protected Weaselhead Natural Environment Park and the 24 wetlands that are within this transportation utility corridor. Cost savings from the reduction of this ring road and associated interchanges from 16 lanes to 6 or 8 lanes can then be used to build a better bridge across this very special river valley, i.e. a clear span bridge that complies with flood plain management best practices and the spirit and intent of the Flood Recovery & Reconstruction Act. With the reduction of scale, the highway alignment can then be pushed further away from homes along highway 8, 37th Street and 101st Street. We are also calling on Minister Mason to build proper noise attenuation berms and to reduce the impact of gravel hauling along highway 8. These are all reasonable requests and requests that residents along the TUC have been requesting since 2005. Given this change in strategic direction, we trust that Minister Mason will do the right thing and issue an immediate stop work order to facilitate design changes to the SWCRR.